Lahore, Islamabad (July 14, 2018): Former prime minister Nawaz Sharif and his daughter, Maryam Nawaz, were arrested Friday night upon their arrival in Lahore, a week after being sentenced to prison in the Avenfield Properties case. 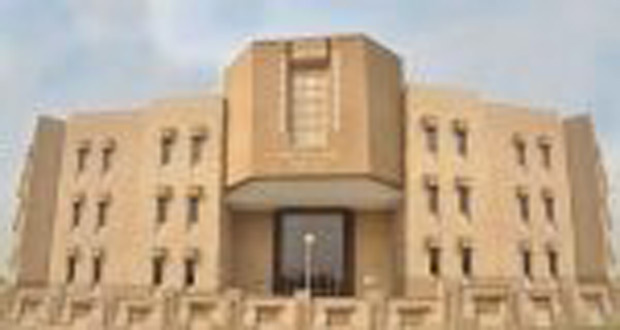 Last week, an accountability court in Islamabad sentenced the former three-time premier to a total of 11 years in prison and slapped a £8-million fine (Rs1.3-billion) for “owning assets disproportionate to known sources of income”. 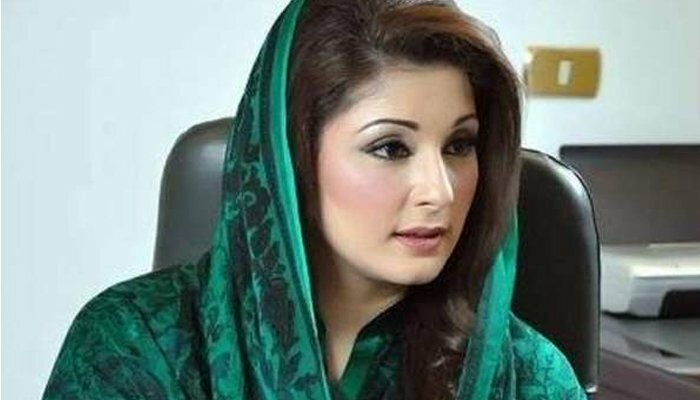 His daughter, Maryam, on the other hand, was sentenced to eight years with a £2-million fine (Rs335-million), while her husband, Captain (retd) Safdar, was handed a one-year prison sentence. 02:18 am: Former Prime Minister Nawaz Sharif and his daughter Maryam Nawaz have been provided ‘B’ class facilities in Adiala Jail. While the government has changed its plan for the third time and decided to keep the duo in Adiala Jail, said sources. Police and administration officials have been informed about the decision. 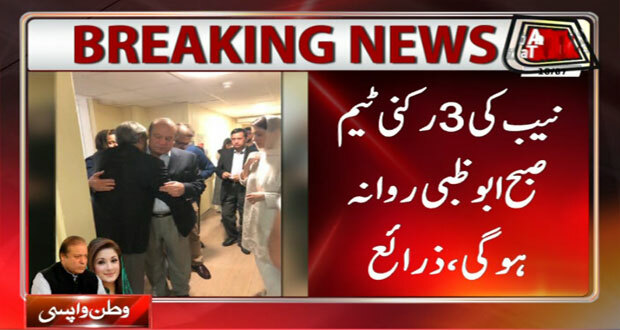 02:00 am: Medical team declared PML-N supremo Nawaz Sharif and his daughter fit and healthy. 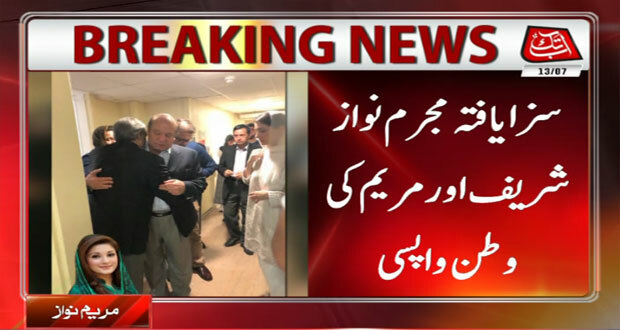 01:15 am: Former Prime Minister Nawaz Sharif and his daughter Maryam Nawaz underwent medical checkup in In Adiala Jail. 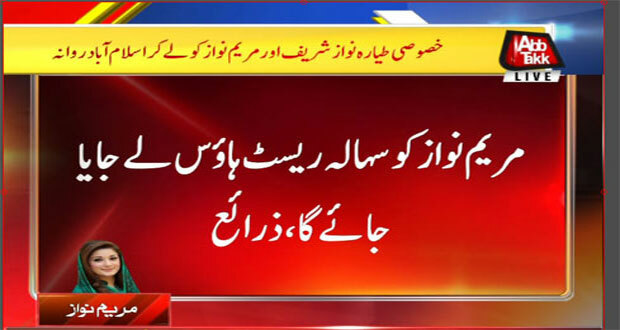 12:50 am: The accountability court will hear Al-Azizia Steel Mills and Flagship Investment references against former Prime Minister Nawaz Sharif in Adiala Jail. Ministry of Law and Justice has issued a notification in this regard. 12:35 am: PML-N President Shehbaz Sharif announced to end the rally in Lahore. 10: 40 pm: The plane carrying Nawaz Sharif and Maryam Nawaz landed at Islamabad airport and expected father-daughter duo will send to Adyala jail immediately after their arrival. 10: 35 pm: Accountability Court issued the arrest warrant of Nawaz Sharif and Maryam Nawaz to send duo to prison while the court has appointed a magistrate who will hand over offenders to jail superintend. 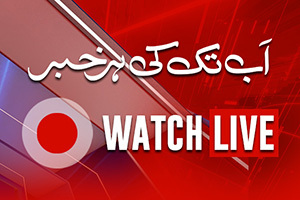 10:30 pm: The judge of Accountability Court Bashir Juma, who has sentenced Nawaz Sharif 10 years and Maryam Nawaz seven years in jail, and head of National Accountability Bureau (NAB) prosecution team Muzaffar Abbasi arrived in the judicial complex for expected appearance of Nawaz Sharif and Maryam Nawaz. Meanwhile, the media persons have been bared to enter in the judicial complex. Police cited that judge has given direction to not allow journalists to enter in the complex. 9.50 pm: Nawaz will be transferred to Adiyala Jail, while his daughter will be sent to Sahala Rest House after arriving Islamabad. 9.45 pm: The Plane carrying Nawaz, daughter took off. Its heading towards capital Islamabad. 9.4o pm: The Plane carrying Nawaz, daughter taxing at runway. 9:30 pm: Nawaz Sharif refused to sit in NAB vehicle and moved towards airport by feet, while security personnel have surrounded the vehicle. 9:20 pm: Mother of Nawaz Sharif brought to the old terminal of the Lahore airport to meet her son Nawaz Sharif, grand daughter Maryam Nawaz. NAB said it has arranged two helicopters, which are expected to shift the father-daughter duo to Adiala jail in Rawalpindi. 9:15 pm: Former prime minister Nawaz Sharif and his daughter Maryam Nawaz arrested at Lahore airport and their passports have also been taken into custody. A National Accountability Bureau (NAB) team has taken Nawaz and Maryam in its custody. According to reports, the former premier and his daughter are cooperating with NAB officials. 8:45 pm: The flight# EY243 carrying Nawaz Sharif and Maryam Nawaz landed at Lahore airport. Duo likely to shifted Islamabd tonight. 8:00 pm: The mother of Nawaz Sharif left Jati Umra for Lahore airport to welcome her son. 7:40 pm: Sources claimed Nawaz Sharif and Maryam Nawaz flight likely to divert Multan airport as security high alert has also been issued in the city. 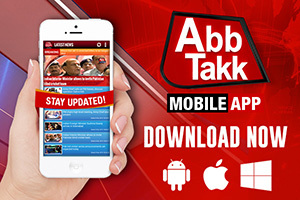 7:30 pm: Section 144 imposed around Islamabad airport as mobile phone service has also been suspended. 7:20 pm: The flight# EY243 carrying Nawaz Sharif and Maryam Nawaz entered in Pakistan’s territory. 6:30 pm: Clashes erupted between police and PML-N workers at Ravi Toll Plaza that left three police personnel injured. The rally coming from Sheikhupura have also clashed with police. Workers pelted police van with stones, however, police shelled tear gas to disperse them, in the result, three police personnel got injuries. The ASI and tow police constables among the injured. 6:00 pm: The flight# EY243 carrying Nawaz Sharif and Maryam Nawaz takes off from Dubai airport for Pakistan and is scheduled to arrive in Lahore at 8:43 pm, Etihad Airways confirmed. 40 other N-League leaders have also accompanied him. 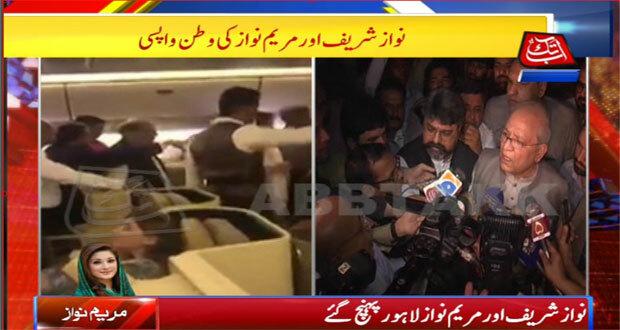 5:40 pm: Nawaz Sharif and Maryam Nawaz have embarked in the plane from Dubai airport for Pakistan. The flight# EY243 expected to reach on the Lahore airport at 8 pm. 5:30 pm: Following the Supreme Court orders, the release process of PML-N workers has been started. 5:00 pm: The PML-N workers in a big rally started moving towards Lahore airport to accord welcome to former prime minister Nawaz Sharif and his daughter Maryam Nawaz. 3.15 pm: Caretaker Home Minister of Punjab, Shaukat Javed has said that security arrangments have been strict due to Bannu attack, mobile phone services are also suspended in this regard. 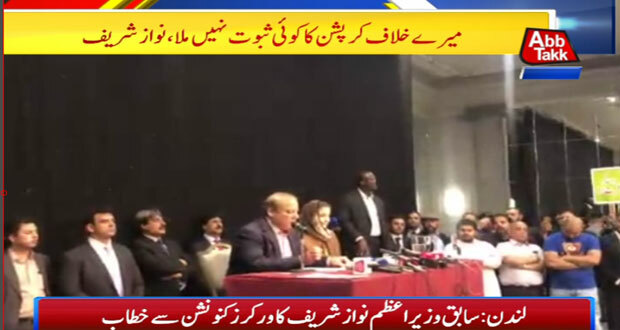 Addressing a presser in Lahore, Shaukat Javed said that strict security measures have been taken in connection of arrival of former PM, Nawaz Sharif. He added that list of arrested persons was presented in Lahore High Court today. No one has taken permission to take out rally today from the PML-N ranks, only passengers and staff will be allowed to enter in the airport. 2.30 pm: Nawaz’s Sharif’s flight# EY243 from Abu Dhabi to Lahore has been delayed by two hours and will now land at Allama Iqbal Airport at 08:00pm. The plane was earlier scheduled to reach at 06:15pm. The flight was scheduled to land at 6.15pm at Lahore Airport Earlier. Earlier in the morning, Nawaz Sharif along with his daughter landed at Abdu Dhabi Airport. They had departed for home from London’s Heathrow airport on Thursday evening. 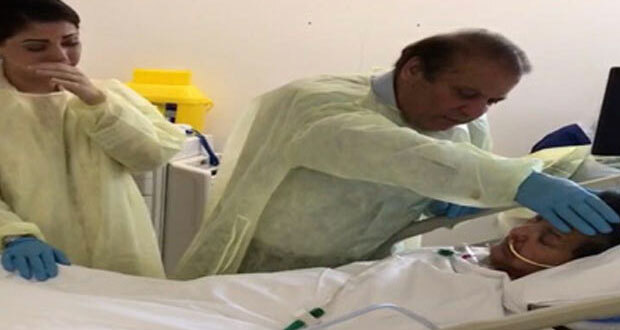 Maryam Nawaz also shared some emotional pictures, which were taken before their departure at the London hospital where Begum Kulsoom Nawaz is under treatment, on Twitter. In one picture, Nawaz and Maryam can be seen bidding a full of tear farewell to ailing Kulsoom Nawaz. Hussain Nawaz, Maryam’s son Junaid Safdar and other family members are also seen saying goodbye to the convicted persons. On the other hand, the local government on late Wednesday brought containers to place at various places in Lahore to bar Pakistan Muslim League-Nawaz (PML-N) supporters from welcoming ex-prime minister Nawaz Sharif and his daughter Maryam Nawaz. Senior Pakistan Muslim League-Nawaz (PML-N) leaders including Khawaja Saad Rafique and others have been detained on the orders of the Inspector General of Punjab Police. Punjab Inspector General of Police Kaleem Imam has written to the Lahore deputy commissioner ordering the detention of seven PML-N leaders and one’s house arrest for 30 days. Apart from Saad Rafique, the party leaders include his brother Khawaja Salman Rafique, Mian Marghoob, Bilal Yasin, Khwaja Imran Nazir, Malik Saiful Malook and Waheed Alam Khan. Moreover, PML-N’s Haji Rana Bakhtiar has been ordered to be placed under house arrest. The mobile phone and internet services have been suspended in various parts of Lahore ahead of Nawaz Sharif’s return from London today. A letter from Punjab government is circulating on social media in which the Ministry of Interior has been requested to switch off the mobile phone services in certain areas of the metropolis that include: Lahore Airport, Walled City area, Shadra, Bari/Hadyara area, Nawaz Town area. Some citizens have also complained of interruption in internet services. The Lahore High Court (LHC) has ordered the release of arrested PML-N workers by 2 pm today. Hearing a PML-N petition against the arrests today, Justice Anwarul Haq inquired the Punjab Home Secretary and Inspector General of Police (IGP) Punjab Dr Syed Kaleem Imam if they had a list of the detained individuals. The home secretary responded by saying that 141 individuals had been arrested. The court then ordered the home department to immediately present the list of the detained individuals. The IGP then informed the court that the arrests were made on account of terrorists. President PML-N and former Cheif Minister of Punjab, Shahbaz Sharif has urged party workers to accord warm welcome to former Prime Minister, Nawaz Sharif and his daughter Maryam Nawaz on their landing in Lahore today. 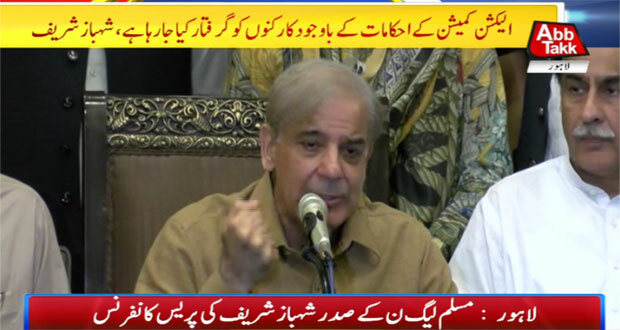 In his video message to party workers, Shahbaz Sharif said that he is in Lahore and waiting to welcome his party supremo. Shahbaz urged party workers to reach Lahore Airport in large numbers today. 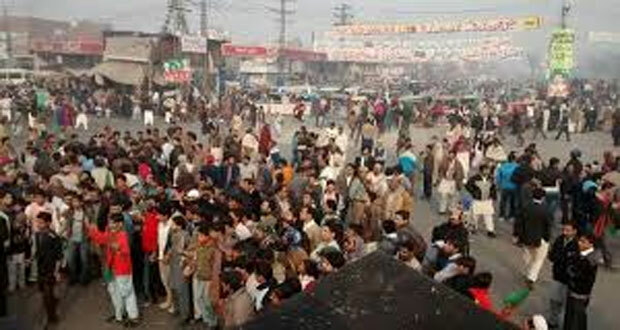 11:00am – Lahore police have increased the number of the security personnel from 2,500 to 10,000 to maintain law and order and to cope with any untoward situation in the provincial metropolis on Friday (today). 09:45am – Ousted prime minister Nawaz Sharif has released a video message ahead of his arrival in Pakistan, asking people to support him in his struggle which he said he is waging for the future of coming generations. 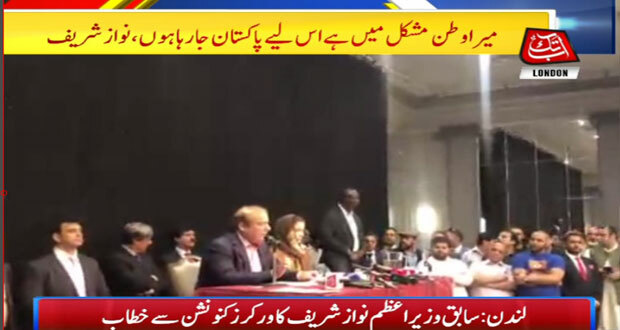 09:31am – Pakistani officials in Abu Dhabi said that they have not been informed of NAB team in the Gulf state adding that under international laws Nawaz Sharif and Maryam Nawaz can not be arrested without completing legal formalities. 08:45am – The flight from London landed at Abu Dhabi airport earlier today where the PML-N leaders would stay for seven hours before departing for Lahore. 08:00am – 10,000 police officers will be deployed across Lahore on Friday to ‘maintain law and order’ as the PML-N Quaid Nawaz Sharif arrive. 03:20am – PML-N leaders, including Abid Sher Ali, claimed that authorities have launched crackdown on party workers who wanted to go to airport to welcome their leader Nawaz Sharif, saying hundreds of supporters including some local bodies’ representatives have been detained. 02:40am – Security has also been beefed up at New Islamabad International Airport ahead of former prime minister Nawaz Sharif’s arrival . Airports Security Force (ASF) and law enforcing agencies reviewed the security arrangements. Special contingents of commandos and police officials have been deployed at the airport. 02:10am – National Accountability Bureau (NAB) Chairman Justice (r) Javed Iqbal has summoned an emergency meeting for today (Friday) in wake of Nawaz Sharif and his daughter Maryam Nawaz’s return to Pakistan to face jail term. The meeting will review the overall situation pertaining to the return of former prime minister. 01:00am – The National Accountability Bureau (NAB) has arranged two helicopters to shift the father-daughter duo to the prison. One of the two choppers would be stationed at Lahore airport, while the other would be in Islamabad. 12: 30am – The United Kingdom (UK) police arrested Maryam Nawaz’s son Junaid and Hussain Nawaz’s son Zikeriya in London for assaulting a protester outside the Avenfield Apartments. The arrest comes shortly former prime minister Nawaz Sharif and his daughter Maryam Nawaz Sharif left for Heathrow Airport to board a flight for Pakistan. 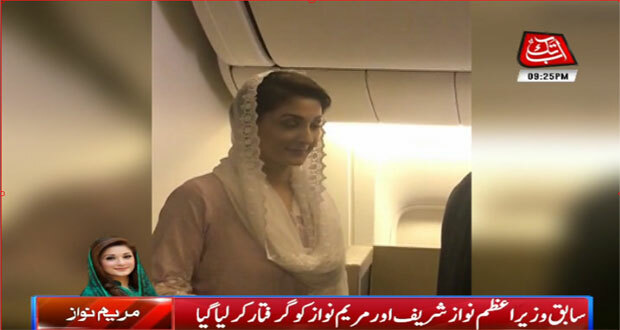 National Accountability Bureau (NAB) has decided to arrest the former Prime Minister Nawaz Sharif and his daughter Maryam Nawaz in the plane as it enters in Pakistani territory, said sources. According to the details, a three-member NAB Team will proceed to Abu Dhabi, UAE, in the morning today to inform the management of the private airline of UAE to through Pakistan embassy that Nawaz Sharif and Maryam Nawaz have been convicted by the accountability court in Pakistan and the NAB has their arrest warrants. Therefore their custody will be given in the flight when the plane enters in Pakistani territory. After taking the custody NAB will apprise the local and international media about the letter of PEMRA as according to Pakistan law interview and glorifying any convicted person is illegal. Therefore media persons try to avoid talking interview during the flight in Pakistani territory otherwise PEMRA laws will be fully implemented upon them. NAB is also planning to shift the accused persons in Attock forte after the Adiala Jail as law and order situation can be created by the local party leaders and workers as they have done in the case of arrest of Captain (R) Safdar. NAB has registered a case against shelter providers and violators and on NAB’s complaint FIR was registered but not a single accused have been arrested by Rawalpindi police at yet, said the sources. 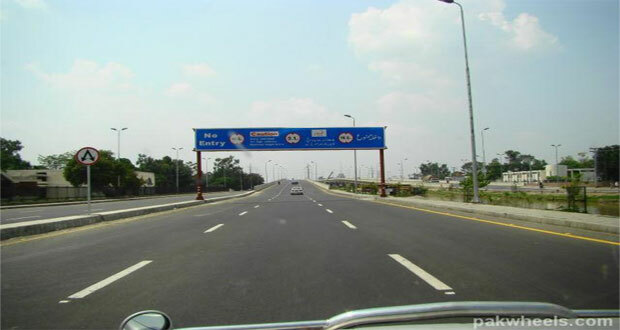 All national highways and motorway will be closed ahead of former prime minsiter Nawaz Sharif’s arrival from London. The Punjab government has taken various measures to avert any untoward incident, which includes blocking of various main intersections. 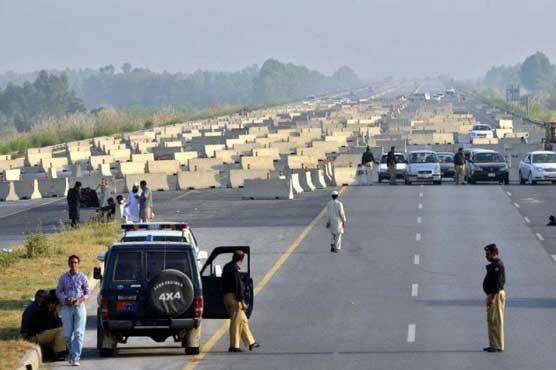 The National Highways and Motorway Police have been tasked to close key entry and exit routes, including highways and motorway, as authorities beef up security measures. Containers were brought in on Wednesday night and installed at various points across Lahore to bar PML-N supporters from welcoming the father-daughter duo. According to details, as many as 22 officials of the National Accountability Bureau (NAB) and 100 elite commandos will be deputed at the Allama Iqbal International Airport. The arrangements for the shifting of the convicts, who are coming from London after inquiring health of Begum Kulsoom Nawaz, to Adiala jail through helicopter have been completed while a letter has also been dispatched to accountability court judge Muhammad Bashir to reach Adiala jail on July 13. Follow this traffic plan to navigate your way through the expected traffic jams. Traffic coming from Islamabad will enter Lahore via motorway through Thokar Niaz Baig, Qizilbash Chowk and Shaukat Khanum Chowk. Traffic from GT Road will enter the city via Kala Shah Kaku through Thokar Niaz. To exit Lahore, use Moulana Shaukat Ali Road, Main Boulevard Johar Town, Shaukat Khanum, Qizilbash Chowk, Motorway Interchange or Multan Road. For people who have flights to catch: reach at least six hours prior to the departure time at designated areas in Lahore. They will be transported to the airport via a shuttle service. The shuttle service will be provided from Bhatta Chowk, Chungi Dogaij, Gajjumata, Mehfooz Park and Niazi Shaheed Park. Addressing a presser in Lahore on Thursday in Lahore alongside former railways minister Saad Rafique and former National Assembly speaker Sardar Ayaz Sadiq, Pakistan Muslim League-Nawaz (PML-N) president Shehbaz Sharif on Thursday slammed the caretaker government set-up following arrests of more than 100 workers from Lahore ahead of party supremo Nawaz Sharif’s return and warned that the administration and police officer would be held accountable for the excesses meted out to his party workers. 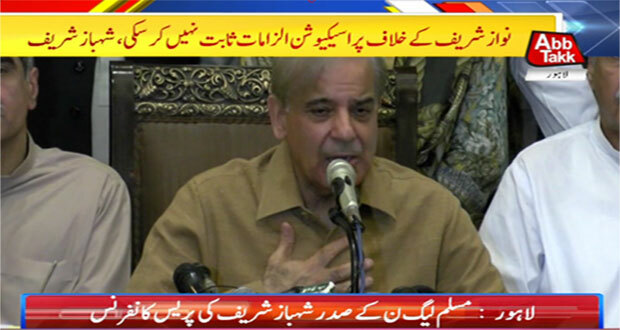 Shehbaz Sharif said that hundreds of PML-N workers have been arrested across Punjab, who were planning to welcome Party Supreme Leader, Nawaz Sharif. “Time doesn’t stand still, it will change,” he said. “I ask police and administration to stop the oppression and excesses. We will bring you to justice if the Pakistan Muslim League-Nawaz comes into power”. He added that PML-N will warmly welcome Nawaz Sharif and his daughter tomorrow, preparations are underway in full swing. “Everyone is involved in this blatant rigging from the caretaker Punjab chief minister to the caretaker interior minister and police officials,” the PML-N president asserted. “The whole world knows PML-N is being targetted,” he added. Doors of workers’ houses were broken down and they were arrested last night, the former Punjab chief minister shared while adding that around 300 workers were also arrested from Rawalpindi on Tuesday. 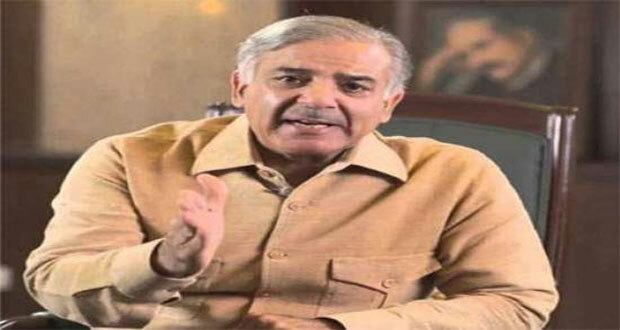 “No logic can defend the 30-day detention of our workers,” Shehbaz upheld. Urging the Election Commission of Pakistan (ECP) to take notice, the PML-N president said, “By the time our workers are released polls will be over.” Shehbaz also warned police officials against arresting his workers. “Know that time never remains the same and after we win the polls, we will hold you accountable on July 26,” he said. Further, the Punjab chief minister appealed to the nation to help build Pakistan and not destroy it. “How can you allow Imran Khan to rule with his flawed policies?” he asked. “Section 144 has been imposed for us while Imran Khan has been permitted to hold a rally today,” he further said. “You can do all the rigging you want, we will still win the July 25 polls,” he upheld. “The administration and police should stop injustices as we will not be intimidated,” he said. “The caretaker set-up is a salaried puppet,” Shehbaz added. Further, the PML-N president said the verdict in the Avenfield reference was ‘unjust’. “Judge’s verdict stated that there was no proof of corruption against Nawaz,” he said while adding that he was sentenced based on presumptions. The presser came after PML-N’s top leadership met to discuss the plan of action following the arrests and arrangements for Nawaz’s return. Several UC chairmen, vice chairmen and councilors were among those arrested from various areas of Lahore. Following the arrests, a large number of PML-N workers protested outside police stations and key party leaders — Saad Rafique, Sardar Ayaz Sadiq and Pervaiz Malik — held an emergency press conference at 3:30am. The National Accountability Bureau (NAB) has arranged two helicopters for Nawaz and Maryam’s arrests upon their return. 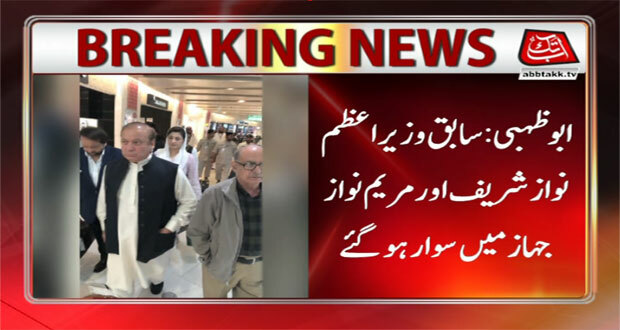 The NAB plans to position one helicopter at Lahore’s Allama Iqbal International Airport and the other at the New Islamabad International Airport to take the two PML-N leaders into custody immediately after they land. Further, containers have been placed at Mall Road in an expected bid to seal major routes leading to the airport in order to thwart political rallies on Friday. Earlier on Wednesday, the former prime minister Nawaz Sharif reiterated his stance over his return to Pakistan and said that prisons or execution could not stop his feet for the struggle of honuor to vote. He said that he would not stop now whether he was taken to prison or gallows. “I am going to Pakistan as my country is in hot waters. I am going there to fulfill the promise of honour for vote,” he said while addressing party convention in London. “These people have not given a prison sentence to my daughter, they have given the sentence to every daughter of this nation,” he said. Pakistan Muslim League-Nawaz (PML-N) supremo Nawaz Sharif said that he was returning to the country leaving his wife Kulsoom in Allah’s protection. The former premier said that he wished to see his wife opening her eyes again, requesting the nation to pray for her recovery. Sharif claimed that the accountability judge had said that no evidence of corrupt practices was found against him. “When they could not find anything for a year, they looked for the iqama, and said that I did not take an imaginary salary from my son,” he alleged, adding that he was sentenced in the corruption reference even though no corruption was proven against him. He said that he was returning “despite seeing a prison cell in front of him.” “I am returning to fulfill the promise of giving respect to vote,” Nawaz said, adding that he would not abandon his nation. Nawaz said the people of Pakistan once again saw the “real face” of justice. “Having searched in several countries of the world, it had to be written that there was no evidence of corruption [against me].” He maintained that he respected every institution of Pakistan, noting that he made the country a nuclear-capable state. He said that they were getting this chance for a change after two weeks, adding that the forthcoming election would decide their fate. “Every Pakistani will have to hold his vote in hand and think,” Nawaz said, adding that he would address the people at Lahore airport on July 13. He urged the masses to also set out of the homes on July 25 and announce such a verdict making the world pay a tribute to them. “My daughter Maryam is also going to prison with me,” the former premier said, adding that he was ready to face any difficulty or hardship for the sake of country. “Brave masses should set out of their homes like lions; Shehbaz will lead the crowd to [Lahore] airport,” he said. “The dictator, who imprisoned judges, is roaming free, and no one has the courage to bring him and put on a trial,” Nawaz criticised. The former premier said that July 25 election was going to be the biggest referendum. “How did the petition, which was discarded after being labelled as useless, become sacred,” he questioned. Earlier On Wednesday, the leader of Pakistan Muslim League (PML-N) Maryam Nawaz said that the legal team was working on protective bail option for her and Nawaz Sharif. “Everyone knows why the N-League leaders are being arrested, however, the time has come to take harsh decisions,” she said while talking to media in London. Maryam Nawaz warned that each conspiracy hatched against Nawaz Sharif had faced failure as the voice raised against cruelty can never be silent. Earlier on July 11, Pakistan Muslim league Nawaz prepared a comprehensive plan to receive former premier Nawaz Sharif and his daughter Maryam Nawaz on their return to home, who are coming back on July 13. PML-N president Shehbaz Sharif will lead a rally from Muslim Masjid in Lohari Gate after Friday prayers, where he would be joined by Hamza Shehbaz and other senior leaders of the party. A private bulletproof container has also been acquired by the party to transport senior PML-N officials through their way to Lahore airport to welcome the ex-premier. The container would be air-conditioned, having wi-fi, jammers, comfortable sofas and bed. More than 100 local leaders and workers of Pakistan Muslim League – Nawaz (PML-N) have been arrested during a crackdown by the police in different areas of Lahore on Wednesday night. The detained activists of PML-N were sent to Kot Lakhpat jail for one month. A large number of PML-N workers and leaders hold protest demonstrations and set tyres on fire in different areas of the city. They also chanted slogans against the caretaker Punjab CM during the protest demonstrations. PML-N leaders were of the view that they were preparing to welcome former Prime Minister Nawaz Sharif at the airport when the police crackdown against them and took over 100 activists from different areas of the city. Many PML-N union council chairmen, vice chairmen and Councillors were among the detainees. On the other hand, police said that they were conducting the operation without any discriminating against miscreants in the city. The officials said that the arrested people belonged to different political parties. The police officials said that no-one will be allowed to take laws into his own hands. 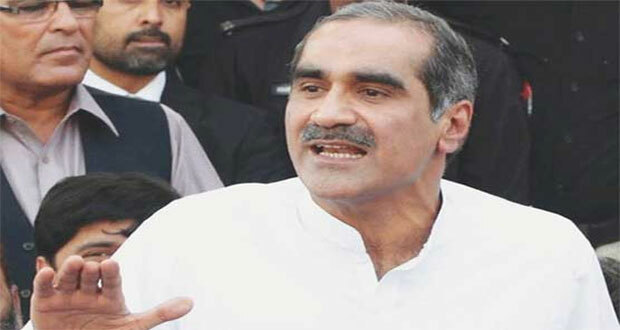 Earlier on , Pakistan Muslim League – Nawaz (PML-N) Leader Khawaja Saad Rafique held a joint press conference along with Sardar Ayaz Sadiq and Pervaiz Malik and demanded of the caretaker Punjab chief minister to stop the ongoing crackdown against his party and release all the arrested activists. While addressing an emergency press conference at PML-N central secretariat in Model Town, Saad Rafique said that they will give a historical welcome to their beloved leader Nawaz Sharif on his arrival in Lahore on July 13. He said their activists and leaders were being sent to Kot Lakhpat jail. 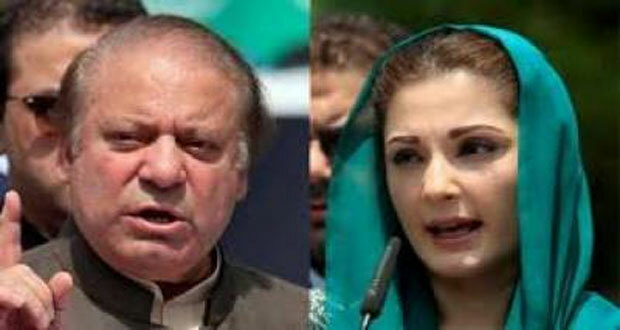 He demanded of the caretaker Punjab CM to stop the crackdown against the workers of PML-N.
National Accountability Bureau (NAB) has taken all necessary measures to directly move former Prime Minister Nawaz Sharif and his daughter Maryam Nawaz to Adiala jail via a helicopter from Lahore airport, said sources. 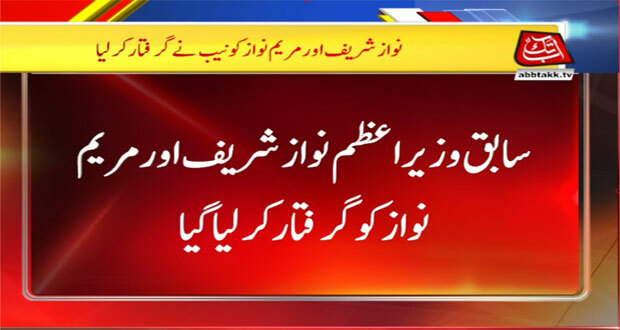 According to sources, the former premier and his daughter will be moved to Adiyala prison via helicopter, for which director general (DG) of National Accountability Bureau (NAB) Lahore has also written a letter to the NAB chief. The sources said the accountability court judge would also be requested to come to the prison administratively. The sources further informed that Nawaz and Maryam will be arrested from the airport, adding that the NAB chairman will contact the Ministries of Interior and Defence for providing a helicopter. Nawaz is currently in London to tend to his ailing wife. He is expected to return to the country on July 13, after he was sentenced to 11 years in prison by an accountability court in Avenfield properties reference against the Sharif family. Last week, the former premier was sentenced to a total of 11 years in prison and slapped a £8 million fine (Rs1.3 billion) in the Avenfield properties reference, while his daughter Maryam was sentenced to eight years with a £2 million fine (Rs335 million). Additionally, Nawaz’s son-in-law Capt (retd) Safdar has been given a one year sentence without any fine.